Electroporation Medical Device for veterinary use - Paragon Innovations, Inc.
Electroporation is emerging as the preferred method to administer DNA vaccines, and skeletal muscle appears to be one of the best target tissues. Based upon years of research, ADViSYS, Inc. was developing a cutting-edge electrokinetic device (EKD) using the latest innovations in gene delivery to muscle cells. ADViSYS’s enducer is a device designed to introduce small molecules, plasmid DNA, or dyes into muscle fibers through electroporation. Existing electroporation technology had the potential for cell destruction through loss of square-wave function and overheating. 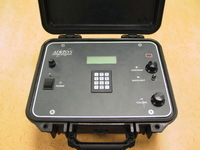 ADViSYS wished to avoid this by introducing a new technology: pulsed constant-current control. The previous technology used to introduce DNA into muscle fibers could cause cell damage through loss of square-wave function. Initially, ADViSYS had engaged a design firm who had little success trying to implement ADViSYS’s concepts for an electroporator based on constant current. It was crucial to find a product development company with the expertise to design and develop this new technology. They found a better way. Paragon Innovations. ADViSYS succeeded with the design of a high-voltage pulse current in their Electroporation Enducer with the added benefit of greater ability to control and measure the electroporation process. The constant- current device maintains a square-wave function in the target tissue irrespective of changes in tissue resistance. This versatile technology can be applied to facilitate plasmid delivery in both large and small animals. ADViSYS wanted to create something totally new, something that hasn’t ever been done in our field. Paragon helped us to break new ground and create a truly unique piece of equipment. The level of technical support we received after development was quite useful.